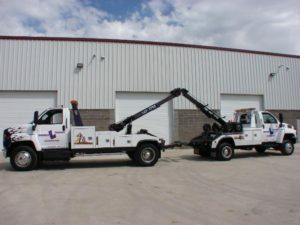 Double L Towing has a long history of serving communities with full towing, hauling, and road-side assistance services – from light vehicles to heavy equipment. We have grown from a 6-vehicle operation to a 30-unit business that provides quick and efficient roadside assistance and even environmental cleanup. Service trucks that are capable of boosting, tire changes up to 3/4 ton, unlocks & trailer hauling, plus traffic control/pilot trucks. 4×4 recovery units with twin line; capable of towing, winch recovery, boosts, unlocks, & traffic control. Medium-duty towing with winch recovery, boosts, unlocks & traffic control. Single-axle tilt decks on air-ride suspension, capable of hauling up to 14,000 lbs. Capable of hauling forklifts, skid-steers or antique cars. A 3-ton 4×4 twin-line wrecker capable of towing 25,000 lbs. & winching 20,000 lbs. Twin-line wrecker with a 25-ton under lift — air ride suspension — capable of towing 80,000 lbs., including straight trucks, tractors, & fifth wheel trailers with a tow rating of 80,000 lbs. & capable of winching 50,000 lbs. A 5-ton truck capable of towing 40,000 lbs. & winching 35,000 lbs. A versatile skid-steer loader with its universal quick-attach, capable of hooking up to just about any skid-steer attachment in the business. The Landoll® 455-53 hydraulic trailer, is designed to haul heavy loads up to 100,000 pounds. The unit, measuring 53 feet, has a 6.5-degree load angle, 20,000 lb. winch, rides on air suspension, operates with wireless remote, includes hydraulic dock levellers & has an on-board scale. All environmental issues are dealt with per regulated standards. Our flagship Landoll 455-53 hydraulic trailers can be loaded with the toughest equipment, including rubber tire equipment. These rugged units are designed for heavy loads, and their reliability and strength ensure the safe and timely transport of our customer’s unique payloads.